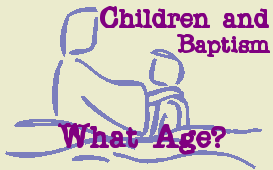 As baptists, our church continually faces the question reflected in the title of this post: How old must a child be before he or she is ready to be baptized? This very question was asked in the comments section a couple days back, and it is an important one. The Bible does not put an age requirement on baptism. But it does describe water baptism as a post-conversion act of identification with Christ. In Acts 2:38, Peter emphasized repentance as a corollary to baptism. In verse 41 of that same chapter, Luke records that it was “those who had received his word” that were baptized. Acts 16:34 indicates that the Philippian Jailer’s household believed before they were baptized. Colossians 2:11-12, 1 Peter 3:18-21, and other passages associate baptism with saving faith; and even the order of the Great Commission puts “making disciples” before “baptizing them” (Matt. 28:19). Thus, without putting an age-requirement on baptism, the Bible indicates that a person must understand the gospel, repent of his or her sin, and savingly trust in Christ before being baptized. If water baptism is an external sign of genuine conversion, then genuine conversion must take place first. At what point, then, is a child capable of understanding the gospel, repenting from sin, and savingly trusting in Christ? Again, Scripture gives no specific age limit. In our experience, however, we have found that most children do not really begin to objectively evaluate their own thoughts until they reach junior high. Before then, they usually feel little concern over the contradictory values to which they cling. Seldom during elementary years do they conscientiously think about and spiritually evaluate life’s demands independently of their parents. This does not mean that all young children are incapable of committing the rest of their lives to Christ and being indwelt by the Holy Spirit. However, prior to adolescence, few children truly appreciate the significance of their separation from God, and few have sufficient mental sophistication to project far enough into the future to commit “the rest of their lives” to anything. Although we do baptize eleven or twelve year olds from time to time at Grace Church, our children’s pastor spends enough time in conversation with them beforehand to settle any doubts he may have in two areas: (1) has the child actually rejected a worldly set of values in making his commitment to Christ? (2) can he project far enough into the future to make a lifelong commitment? If these issues are resolved, we proceed to evaluate whether or not the child has an understanding of salvation by grace apart from works, and we seek verification from others that he or she demonstrates the fruit of the Spirit in everyday life. We believe a child who can meet these qualifications is ready to identify with Christ and His church through believer’s baptism. The temptation for many parents is to rush their child’s baptism. Our elders here at Grace Church believe it is better to wait, and be absolutely convinced of a child’s conversion, than to baptize the child prematurely — and thereby potentially give an unsaved child a false sense of assurance.